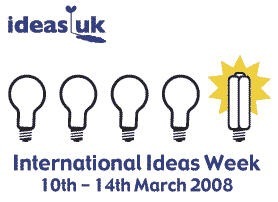 As part of its campaign to highlight the UK’s first National Ideas Week (10-14 March 2008), Ideas UK, the national association of suggestion schemes, is urging UK employers to create office think tanks and open ideas banks. According to a survey of its 100 members, staff suggestion schemes have saved these businesses over £32 million in 2007 alone. 60,000 ideas have been generated by employees and over 35% were implemented to the benefit of member businesses. Making the most of the bright ideas generated by employees is very often at the heart of smaller businesses and startups. Nevertheless even small businesses sometimes forget that bright ideas can come from surprising places within the business. National Ideas Week is a chance for employers to explore practical ways of turning bright ideas into better business. Creative techniques to encourage feedback from staff can sometimes hold the key to widespread participation in this type of suggestion scheme. For those wanting to find out more, Ideas UK is putting on a series of free breakfast seminars on the subject. Call 02920 020608 for more details.